It wasn't quite the "millennium drought" that desiccated Australia for nearly a decade. 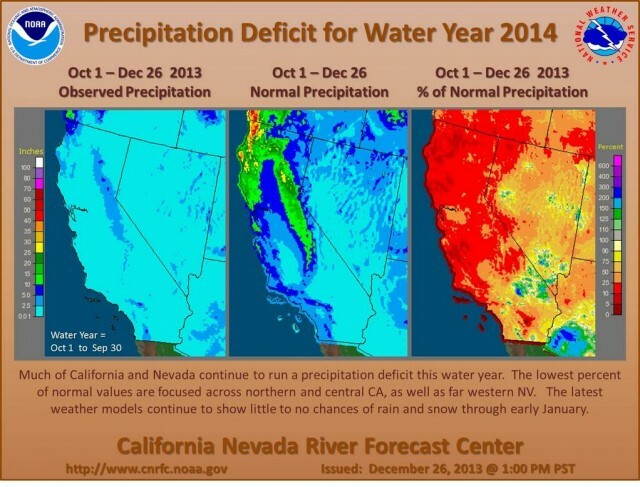 But for many parts of California, 2013 was the driest year on the books. After above-average rain and snow in November and December of 2012, the tap suddenly shut off just as the calendar turned over to 2013, and there's been little-to-nothing since. The 5.59 inches that had fallen on San Francisco by New Year's Eve shattered the previous dry mark of nine inches, set in 1917. The extended dry spell had water authorities and farmers on alert as early as November, when the state's Department of Water Resources (DWR) issued its lowest-ever estimate for water deliveries from the State Water Project: five percent of what water contractors are asking for. That number is notoriously fluid, starting out on the conservative side and rising with the winter snows. In 2010, the only other year that started with a five-percent projection, officials eventually upped deliveries to 50 percent. But this season's first official survey of the Sierra snowpack shows statewide water content at a nail-biting 20 percent of normal. Remote sensors from the northern range clocked in at 11 percent, which is a scant four percent of what water managers like to see on April 1. Long-range forecasts have not been encouraging. Governor Jerry Brown assembled an interagency drought management task force, which began meeting in late December, and some cities have already announced water restrictions -- some voluntary, some not. 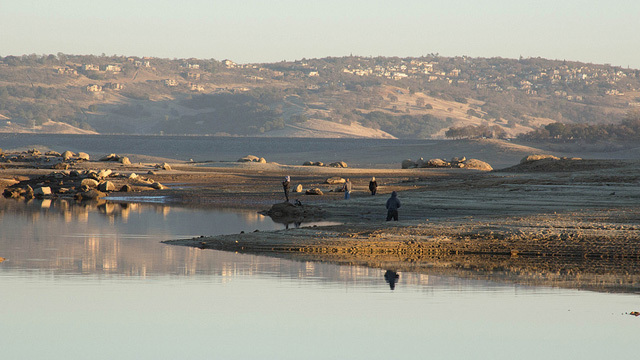 "Keep in mind that about half of California's precipitation falls in the months of December, January and February," said Jeanine Jones, a resource manager at DWR, noting that December is already written off. "Even at the first of the year, we're not at the halfway point of the rainfall season," said Jan Null, consulting meteorologist with Golden Gate Weather Services, adding a note of optimism. "The halfway point of the rainy season is the last week of January." So, with most of the wet season still ahead, "Mother Nature can always throw us a curve ball," as Jones put it. "By the time we have the February snow survey results in hand, that's really when you make the call about which way the water year is going." The first winter snow survey found the Sierra snowpack, which provides about a third of the state's water supply, at just 20 percent of normal. Kelly Redmond, director and climatologist at the Western Regional Climate Center, says that leaves the state with no wiggle room. NOAA's latest three-month outlook has California's drought likely to continue through March. The good news? "The NOAA outlooks are only slightly better than the Farmers' Almanac," said Null. "They're terrible."